Sitting in front of the Mary grotto while my Macie Rose played in the sand, I stared blankly at Momma’s huge rosemary bush, following he twisted branches in and out of the center of the bush. It was tough and twiggy–a hearty desert plant. I pinched some leaves off and crushed them between my fingers, inhaling the strong, woodsy scent. I’ve always loved this herb, though not in its dried form. Fresh is best, chopped into tiny bits so that there’s no need to remove it from the dish. And its scent has such strong associations for me–Christmastime, holidays, savory stews and sauces. I pictured green bits of rosemary in a mash of sugared apricots, and I knew what I wanted to do with all that fruit. I searched online, instantly landing upon FoodinJars’ recipe–I’ve used her recipes before and trust them. It was so simple, these ingredients, already in abundance in Momma’s backyard. Of course, by the time I had this insight, my visit was almost over. Macia and I were leaving the next afternoon. I considered canning the fruit that night in Momma’s kitchen, but I was too tired, after all the packing and visiting and Macie-ing. The following morning I was going to spend with my sister before heading to the airport. I hurriedly packed dusty mason jars, lids, and rings from Momma’s pantry into a paper bag. I grabbed Momma’s sugar canister–hoping it would be enough–and that pink bucket of apricots, and loaded it all into Daddy’s car. I went out back, still in the cool of the morning shade, and clipped several sprigs of Momma’s rosemary. I tried to get the newer branches, since the wood of the older ones was so tough it would be hard to get the leaves off. I wrapped them in a plastic bag and we were on our way. My niece Rachel helped me pit the apricots. When we measured them, we had enough for two batches of jam. She wanted to keep all the pits and plant apricot trees all over her backyard! I told her it was a good idea, that Grandmama would be proud. Macia happily played with her cousins while I jammed. It was good to be working in the kitchen with fruit and sugar, remembering Momma, hearing my little girl squeal with delight as she was entertained. Apricots, sugar, lemon juice, rosemary. Pit, mash, heat, jar. It was good to be there. It was good to bring Momma back a little bit, as she returns each summer in her garden. I know that I will always miss Momma, that the pain of losing her will never fully go away. But as I was preserving her apricots, I realized that we have all preserved so much of her in ourselves. There are intangible things that we have kept, and we keep her with us still. Not just figuratively. She does live on in us. She is here. 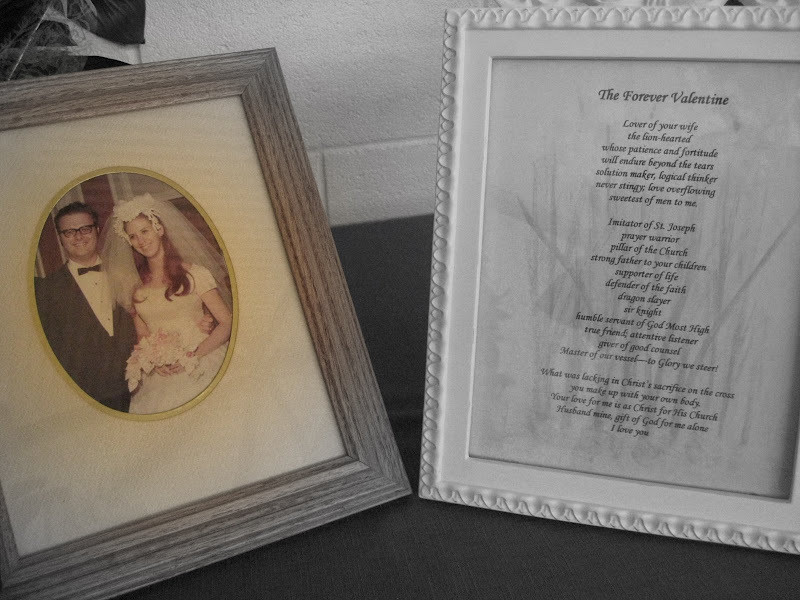 I re-read the poem Momma wrote for Daddy on their last Valentine’s day–a month before she died–which he has framed over his dresser. Their Love was so good, so blessed. Even as I wept for missing her, I felt the goodness in all that we have shared with her, all that she gave us, all that she left us. I go back and look at photos of the funeral and family visits after she died, and I see smiles. Laughter. There is so much joy. I love you, Momma. I love the way you’ve loved us, and taught us to love.